Google is developing a search engine that’s compliant with China’s repressive speech policies, CEO Sundar Pichai confirmed Monday night. The tech giant’s executives are happy with the search engine's performance and they believe it is in accordance with the company’s values, Pichai said at an event hosted by Wired magazine. Employees and public officials have been among the critics of the project, code-named Project Dragonfly, but Pichai said most search topics will not be censored. "If Google were to operate in China, what would it look like? What queries will we be able to serve?" Pichai said at the event. "It turns out we’ll be able to serve well over 99 percent of the queries." "It's a wonderful, innovative market. We wanted to learn what it would look like if we were in China, so that's what we built internally," Pichai also said, advocating a "longer-term view." News about Dragonfly caused outrage among some Google employees, 1,400 of whom signed a letter calling for the company to appoint an ombudsman to investigate the "urgent moral and ethical issues." Google rebuffed the demand. Employees have criticized the company not just for developing Dragonfly but doing so in secret, preventing them from knowing if their work was in service of the censored search engine. One employee, research scientist Jack Poulson, resigned in public protest. "Due to my conviction that dissent is fundamental to functioning democracies, I am forced to resign in order to avoid contributing to, or profiting from, the erosion of protection for dissidents," Poulson wrote to his bosses. Poulson said around five others also resigned for the same reason, although he registered his disappointment over the lack of widespread solidarity in opposition to Dragonfly. Pichai maintains Google’s principles would be advanced by reentering the lucrative Chinese market. "We are compelled by our mission [to] provide information to everyone, and [China is] 20 percent of the world's population," Pichai said. He also justified the company's decision by saying it follows "the rule of law in every country." The rule of law in China is in the midst of a historic period of repression, with religious freedom sharply curtailed and the flow of information strictly controlled under President Xi Jinping. Meanwhile, China has continued its work in cyber and information warfare. Google's critics such as Sen. Tom Cotton (R., Ark.) have blasted the company for refusing to work with the U.S. military on drone technology while it simultaneously partners with China. Pichai said deciding whether to work with the U.S. government or with China isn’t done "by holding referendums," although employees are allowed "an important input." Google has a strong position in China’s mobile phone sector owing to the dominance of the company's Android operating system. The possibility of Google’s procurement and storage of user information locally in partnership with a Chinese company has stoked fears that the communist government could access users’ data, including search history. Google chose to focus on how users would be free to search what they want and might merely have their results restricted. 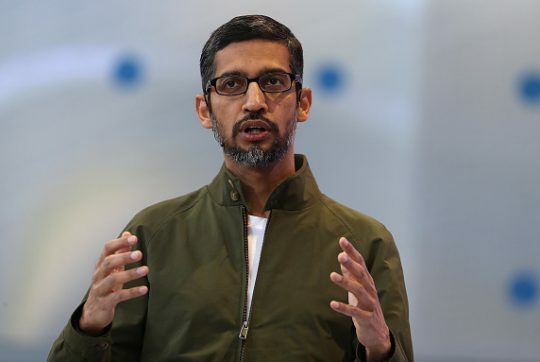 Pichai said these compromises do not prevent Dragonfly from helping some Chinese citizens, such as those looking for information about cancer treatments. This entry was posted in National Security and tagged China, Google, Xi Jinping. Bookmark the permalink.